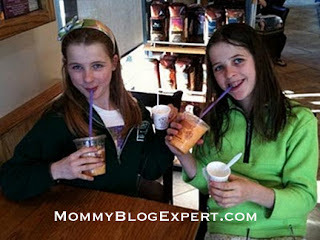 As readers of this blog know, I'm a huge coffee fan and Coffee Bean is one of my favorite places to enjoy it and I often bring my kids along. So, don't drink your coffee alone this Valentine's Day. Instead, take your sweetheart or even your son or daughter with you and get two drinks of your choice for the price of one from Coffee Bean & Tea Leaf. This special offer is only valid on Valentine's Day, February 14, 2012. 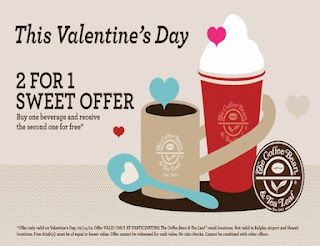 Offer valid only at participating The Coffee Bean & Tea Leaf retail locations. Not valid in Ralphs, airport and Hawaii locations. Free drink(s) must be of equal or lesser value. Offer cannot be redeemed for cash value. No rain checks. Cannot be combined with other offers.